WILDSIDE FESTIVAL is a day of live music, art, wild activities and good food and drink; all in support of local wildlife. Derbyshire Wildlife Trust is delighted to bring you Wildside Festival on the 15th June 2019. Join us for a day of live music, art, wild activities, good food and drink; all in support of local wildlife. The festival is about being entertained whilst getting closer to nature. After all, all our lives are better when they’re a bit wild. The musical line up will be diverse, local and innovative. 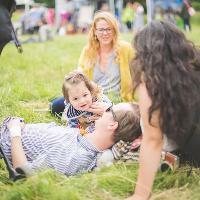 Food at Wildside festival caters for everyone even if you are a vegan, veggie or have an intolerance, Derbyshire Wildlife Trust have everything covered with some quality offerings. After your favourite tipple? Or perhaps you’re a designated driver? Whatever the case we’ve got local beverages on hand…or is that on tap? We want to see your wild side and we’ve got storytellers, inspirational talks and immersive activities planned to help you do just that. There will be lots of activities happening all day for young and old alike. The festival takes place on Saturday 15th June at Derbyshire Wildlife Trust’s Woodside Farm near Ilkeston. The festival opens at 1pm with the official car park accessible from 12pm. The headline act will finish at approximately 10.00pm allowing plenty of time to get all the lovely people off site safely. These timings are subject to change but we will of course let you know if that’s the case.